Sandals Montego Bay Jamaica is an all-inclusive couples only resort located next to Sangster International Airport. We had a great time here and this is our detailed review of our stay - including the good and the not so good. It is one of seven Sandals branded resorts in Jamaica and is the original "resort" of this popular chain. 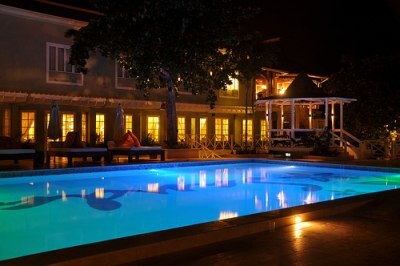 Compared to other Sandals resorts, this particular property is known more as the "party" property. 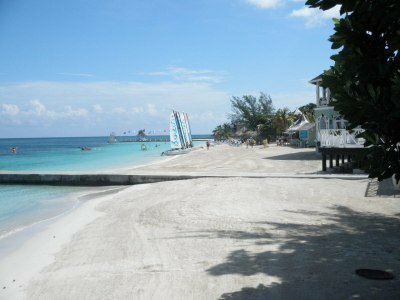 It is more active and has more of an upbeat feel than some of the more laid back Sandals all-inclusives. That is not to say that you can't find your quiet spot or that it is over the top Spring Break like action. Not at all. There is still plenty of space and time to have those romantic interludes with your significant other, so no problem 'mon. 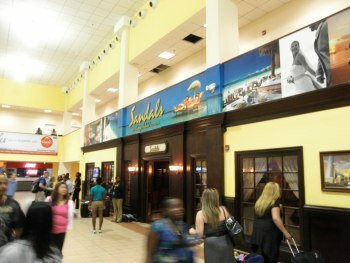 To begin your vacation, once you arrive at the Montego Bay Airport, Sandals has a welcoming lounge at the airport to help you decompress and start your vacation. In the lounge you will find restrooms, snacks, beverages (including Red Stripe and Red Stripe Light beer on tap) and comfortable chairs. Once you hit the lounge, a Sandals representative will take your name and luggage and tag it for the appropriate resort. You will no longer have to handle your luggage for the rest of your stay -except for identifying it during transfers to the Sandals Montego Bay Jamaica resort. We didn't have much time to hang out in the lounge as we were called to our bus about 5 minutes after we arrived. While we didn't have much time there, the lounge is a nice touch and lets you start to relax right away. A porter will take your bags to the bus from the welcoming lounge. Please not that these porters don't work for Sandals and will actively solicit tips. We tipped US$1 per bag. One of the advantages of staying at Sandals Montego Bay Jamaica is that the resort is located right next to the Sangster International Airport. 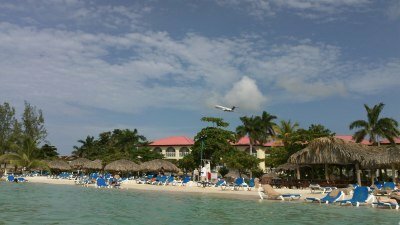 Of course, one of the disadvantages of staying at Sandals Montego Bay Jamaica is that it is located right next to the airport. The long and short of it is you have a very short ride to the resort. If you are staying at Ocho Rios, for example, as we have done, your ride will be close to two hours. Here, you arrive and can be in the water in less than an hour. Once you are at the resort, since it is close to the airport, you will have jets flying close overhead and it will be noisy. However, the sound doesn't last long and I found it didn't bother me at all. To combat this, the resort has kind of made the plane departures sort of a game. As a jet flies overhead, the staff will all wave and that is also the signal for couples to kiss. You just make the best of it. Of course, this isn't JFK. The jets aren't constant. When we were there in September, I would say there were about a dozen planes per day flying in and out. The first one was at 7 am (I don't think the next one was until a couple hours later) and the last was about 7 pm if I remember correctly. I found I didn't mind the jets at all (of course, I used to live in NYC :)); and hey, we were still on vacation while the other poor people were on the way home. Sandals Montego Bay Jamaica is a fairly large resort with 250 rooms and suites spread out over its 26 acres. However, it is not difficult to get around as it is mostly level ground and the main entertainment/restaurant areas are never far away. Rooms and villas are in one to three story buildings so there are no high-rises here. Rooms are spread out between the Bay Roc Beachfront Villas and three other main buildings. There are 19 different categories of rooms to choose from including deluxe rooms (their standard room), suits and villas. Each room/suite also comes with a particular level of service - deluxe, concierge or butler and a garden, beach or pool view. So you have many options and price points available. Just choose the categories that appeal the most to you (and your wallet) and go from there. 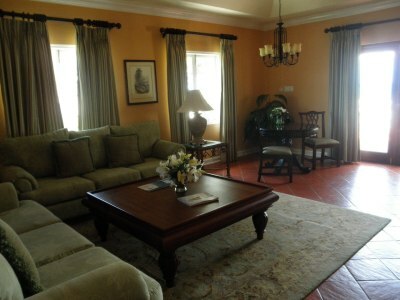 The Bay Roc villas are all recently refurbished and all come with butler service. They are beautiful accommodations and, as you can guess, you will pay for it as they are the most expensive suites at the resort. Many other rooms have also recently been upgraded with mahogany beds, whirlpool tubs, flat screen TV's, etc. All rooms come with refrigerators that are stocked with juices, sodas and water. If you have the concierge level of service, you will also have alcohol in your room. This will include rum, gin, brandy, Red Stripe beer and a bottle of red wine, white wine and champagne. The rum gin and vodka in our room wasn't name brand, unlike at the bars, but I found that it was fine. Of course, if you have butler service, you can choose which bottles of liquor you would like in your room. During our vacation at Sandals Montego Bay Jamaica, we stayed on the second floor in the Almonds Block with the concierge level of service and an ocean view. Our room was refurbished and very nice. 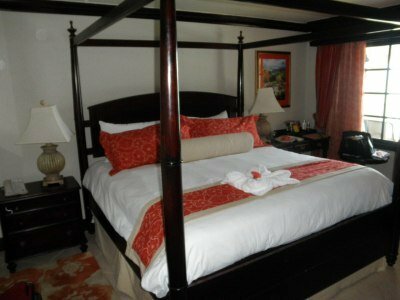 We had a four poster mahogany bed with a flat screen TV, a small sitting area, marbled bath with whirlpool tub and a balcony. We were very happy with our room and had no complaints. Unlike the other Sandals resort Jamaica where we stayed (read our review of Sandals Grande Riviera, Ocho Rios here) which was all about the pools, Sandals Montego Bay Jamaica is all about the beach. This Sandals all inclusive lies on the largest "private" white sand beach on the North Coast (Jamaica's largest beach is in Negril). It is a very nice beach and there was plenty of area to spread around. There was never a lack of chairs which I have found to be a problem at some other resorts in the Caribbean. You didn't have to get up by 8 am to put your towels on a chair to reserve them -something I find extremely annoying. OK, rant over. They also had plenty of towels which you just grab from a cabinet near the pool and beach. We were there in September and the resort was near full occupancy so I don't think the towel/chair experience would be much different during high season. There are also palapas spread out around the beach. Some are first come/first serve basis and some are for rent. The palapas that are for rent come with butler service and a cooler of beer, juice and water. If you rent the palapa for a full day, you will have the use of the palapa from 9am to 5 pm and you will be served breakfast and lunch. Also included in the price of a full day palapa rental is a private candlelight dinner (which is normally US$170 per couple if purchased separately). As of this writing, the charge for a palapa per day at Sandals Montego Bay Jamaica is US$275. Yes, this is expensive. My thinking is, if you were going to go for a private candlelight dinner, why not go the extra yard and get the palapa and butler for the day? It is not that much more and it would be a fantastic romantic way to celebrate a special occasion. Of course, we didn't do either, so who am I to say :). The water is nice and clear and had a sandy bottom. We spent many hours in the water (wish we were back there now) and thoroughly enjoyed the beach. There are also waiters/waitresses that will get drinks for you if you can't bear to drag yourself out of the water and go to the bar. Now that's living. Unlike some other resorts in the Caribbean, this resort is about the beach and not the pools. They do have 4 pools including one main one near the beach. This is in contrast to Sandals Grande Riviera, which was all about the pools - including 3 huge ones with swim-up bars. Since I am all about the beach, I was fine with the pool offerings. The biggest pool is just off the beach and also has a hot tub near it. 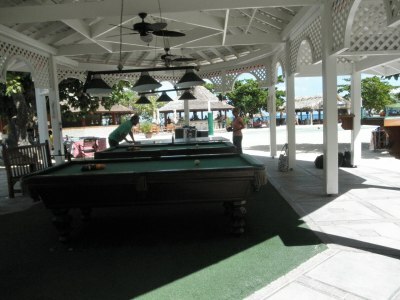 It is a medium sized pool, not one of those huge ones you may find at other resorts, Sandals included. There is a swim-up pool bar located down the beach and next to the piano bar. Unfortunately, it was out of commission while we were there. I think it would have been fun to go out at night, hop in the pool and sing along at the piano bar. Maybe next time. This pool also has a hot tub next to it overlooking the ocean. A good place for a private hot tub is in front of the Almond Block. Walk along in front of that block, along the water, and at the end is a hot tub overlooking the ocean. We never saw anyone in it while we were there, except for us, of course. We took advantage of that and enjoyed a glass of wine there to wind down from the afternoon (which was so hard). Of course, there are rooms behind you so privacy only goes so far. You won't go hungry here. There are 8 dining options available at the Sandals Montego Bay Jamaica resort itself. You also have exchange privileges with their sister properties, Sandals Royal Caribbean and Sandals Carlyle, which gives you another 10 dining options for a total of 18. The two sister resorts are about 10 minutes from Sandals Montego Bay Jamaica and there are shuttles that run every hour between the resorts. 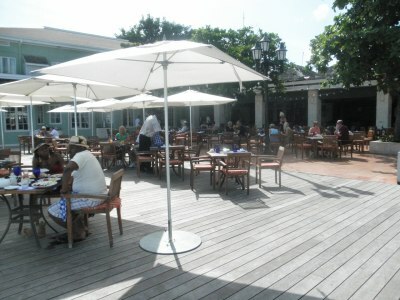 At Sandals Montego Bay Jamaica, breakfast is usually a buffet in the main Bayside restaurant. There are many choices here including a made to order omelet station. A la carte breakfast is available on selected days at the Cucina Romana restaurant. For lunch, you can go to the buffet or get something at the beach grill or pizzeria. The English pub also starts serving at 4 pm if you want something before your main dinner. Dinner is when your dining options really start opening up. There are several different cuisines represented in the restaurants including Italian, English, Jamaican, seafood and Asian stir-fry. There is no dinner buffet option, which is a big plus in my opinion since I much prefer waiter service. Most of the restaurant's dress code is resort casual - which they define as dress shorts/pants, collared shirts/polo shirts and casual footwear. The Oleander restaurant requires resort evening attire which is defined as dress pants for men, shirts with sleeves and collar and closed-toe shoes. So if you want to go to the Oleander restaurant, plan accordingly. A few of the restaurants require reservations and restaurants are closed on certain days so take this into considerations when you arrive. You don't want to miss the restaurant you were looking forward to trying. In general, we thought the food at Sandals Montego Bay Jamaica was very good. There was a nice variety and we could always find something we wanted to try. The only questionable meal was a rack of lamb which my husband had and which was tough. Since that was the only problem meal, we can't complain. I wish I could say that at other all inclusive resorts we stayed at. 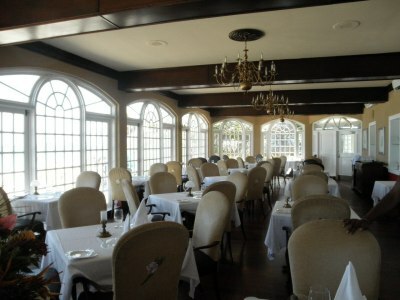 The Oleander room, which doesn't take reservations, is the most popular restaurant in the resort. Therefore, you may have to wait if you go during the prime dining hours. We were lucky and got a table right away but the people that came in after us had to wait for tables. You can always walk over to the nearby bar to quench your thirst while you are waiting. You and your significant other can also opt for a private candlelight dinner on the beach (or other location). Of course there is an extra charge for this. As of this writing it was $170/couple for this service. Can you really put a price on romance? Seriously though, I think it is a bit high for this since all your food is included anyway but it did look great. If you are celebrating something special, it might be worth considering. We didn't partake in this service, so I can't give you a personal opinion on this option. This Sandals resort has a good selection/layout of bars. The main bar is big with plenty of stools and is situated right next the Sky Dome where they have the nightly entertainment. It is open air and is convenient both during the day and at night. The next main bar is the beach bar. 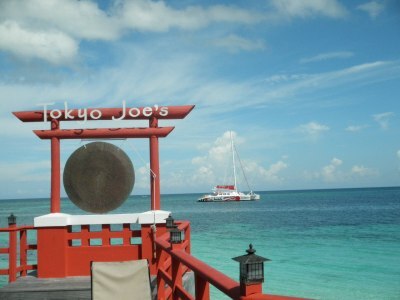 As it states, it is right on the beach and makes getting those drinks while lounging very convenient. You also have one swim-up bar located at the piano bar which is little bit from the main action. As I stated before, the pool was not working when we were there so we missed out on this one. We will just have to go back. There is also an English pub, the Cricketer's Pub. Most Sandals have changed from a disco to a pub and it seems to be a hit with the guests. As far as the alcohol brands go, everything is name brand except for, drum roll please, the rum. Jamaica is known for its rum but there is no Jamaican rum being poured at Sandals resorts. I searched the internet for the answer to this situation and there seems to have been a disagreement with Appleton (the Jamaican rum which was previously served at Sandals resorts until 2010). But who knows what the real situation is? I just wish there could be a compromise and have some Jamaican rum available. But hey, that's me. The rum they are serving is El Doradao from Guyana. Even though it was fine, it was a disappointment. You can find us drinking Appleton and Myers at home, both well known brands of Jamaican rum. I just took it for granted that I would be drinking it while I was in Jamaica. Live and learn. Oh well, that should be the biggest problem I have. As far as other brands of alcohol you will find JW Black, Bombay Sapphire, Chivas, Beefeater, Smirnoff, Finlandia, Cointreau, Baileys and more. We were very happy with this selection. If you are a beer drinker you have a choice of Red Stripe and Red Stripe Light. It is on tap at all the bars and if you have the concierge room or butler rooms, they will stock your refrigerator with bottles of Red Stripe. We both like Red Stripe so we were fine with this choice. As far as wines go, the house wine at Sandals Montego Bay Jamaica is from Beringer Vineyards from Napa Valley. This is included in the price and is what the restaurants and bars are pouring. You will also have a bottle of white wine and a bottle of red wine in your room if you have the concierge level room or higher. You can also order from the premium wine list for an extra charge. I was very pleased with the wines and we felt no need to order from the premium list. Most people I spoke with also found the wines were fine. I have been to all inclusive resorts in the Caribbean where you couldn't touch the house wines - luckily Sandals Montego Bay Jamaica is not one of them. The service at the bars was fine and the bartenders usually had a smile for you. For the vast majority of the time, we never had to wait long for a drink which was a pleasant surprise. There were also waiters going around by the pool and beach to take any orders if you felt yourself getting thirsty. It was a great service. We found the staff and service to be exceptional at this resort. From saying hi as you pass, to getting a drink while hanging in the ocean, to asking if everything was alright at dinner, the staff was wonderful. The service all around was top rate and we give the employees all a big thumbs up. 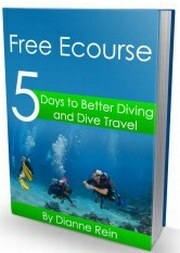 Certified divers are allowed to do 2 free boat dives per day. The dive boat usually went out for 2 morning dives (coming in between dives) and 1 afternoon dive. A typical day would be 9, 11 and 2 - or something very close to that. 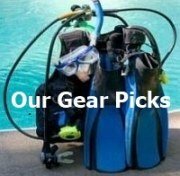 One thing to keep in mind though is that even if you are a certified diver, you need to do a shallow dive with the resort first before you can do one of the deeper dives. This appears to be a hard and fast rule with no exceptions. It doesn't matter if you have 500 dives under your belt, you are going to do a shallow dive with them first. So don't wait until the last day to dive if you want to do a deeper dive. If you are not certified, they offer a resort course so you can experience diving first hand. There is a charge of US$80 for the resort course. If you are interested in this, you might find our page on scuba diving resort courses helpful. Unfortunately, I didn't get a chance to go diving but my husband did. He did a site called The Caverns. After you have gone through signing up, you are split into small groups. While he was diving, there were no more than 6 people per divemaster. Prior to the dive, the divemaster gave a very thorough predive briefing. All the groups go in together and everyone waited on the surface on a drag line until all the divers were in the water. Each dive group then descends together. The divemaster led the dive and it was a dive that wound through finger coral. They saw mostly smaller fish, some trumpets, 2 lionfish (an invasive species), a good amount of sea urchins and sea cucumbers. Toward the end of the dive there was a tight swimthru about 12 feet long but you could still see plenty of light on both sides. My husband and the divemaster went through but the two other couples chose not to go through. They circled around the swimthru and rejoined them on the other side. They did not require a safety stop on this dive since most of the dive was in less than 30 feet of water. The dive profile was initially going to be a max depth of 40 feet for 30 minutes (I guess you couldn't go any deeper than that without a shovel). The actual dive ended up being 40 feet for 37 minutes. Visibility was around 50-60 feet; this dive was shallow though, the visibility may have been better deeper down. The water temperature was about 80F. The divemasters are very conscious of your air - they write down the air for each diver before they began their dive and also check how much air each diver came up with. His overall impression of the dive was that for a basic check out dive it was fairly good. In general, though, it was just a fair dive. Unfortunately, he didn't get to do any more diving. We will just have to go back. But let's face it, Jamaica isn't known as a top diving destination. Talking to people that did more diving there, you can get some good dives in but don't expect spectacular diving. It is always good to get in the water and if you go with that attitude you should be satisfied. And hey, the diving is included in the price so there is nothing to lose. You can't beat that. While we were at Sandals Montego Bay Jamaica, we did the catamaran cruise on the boat, The Red Dread. It is a snorkeling/booze cruise that costs US$75. 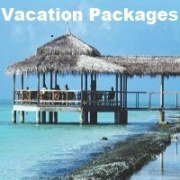 However, they are running a special and you can get a free Catamaran Cruise when you book 6 nights or more Sandals Montego Bay. Just use Discount Code: KATT23 when booking. The first stop on the cruise is for snorkeling and no booze is served until after the snorkeling is finished. The snorkel gear is provided on the boat and you must wear a snorkeling belt, something I find annoying but what can you do? The snorkel spot was right outside the town of Montego Bay and not too far from the resort. The snorkeling was OK - we saw mostly sergeant majors, a couple trumpets, sea urchins and a few other smaller fish. There was a shallow spot and a deeper part of the reef. The formations were more interesting and the snorkeling better in the deeper area so definitely head away from the boat into the deeper area if you go. 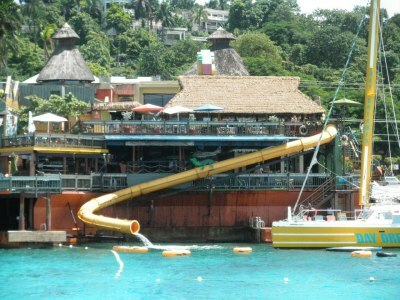 After the snorkeling, the boat stops at the infamous Jimmy Buffet's Margaritaville where there is a water slide you can take from 3 stories up into the water. It was a popular attraction to say the least. There was also a water trampoline you could hang out on. Some people just stayed on the boat - after all the drinks were free there and you had to pay at Margaritaville. After the time at Margaritaville, the boat head back and the party starts. They ask if the crowd wants the games to be clean or dirty. Of course, dirty won. I will let the picture speak for itself. Needless to say, a good time was had by all. You will find many types of watersports available here including kayaking, Hobie cats, glass bottom boat, water skiing and windsurfing among others. The most popular activity seemed to be the Hobie cats. If you are not confident in your sailing ability, one of the watersport workers can take you out. If you are in the mood for a little pampering, there is a Red Lane Spa on the premises for an extra charge. You will find all sorts of services available including many different types of massages. If you are getting married at Sandals Montego Bay Jamaica and the weather is bad (remember that is good luck! ), there is a non-denominational Chapel on the resort grounds as an alternative to an outside wedding. One thing which I was surprised at was that internet service was not included. You had to pay US$14.99 for 24 hours for wireless service or you could use one of their computers for a per minute charge. I would think that a resort of this caliber would include internet free of charge. Hopefully that will change in the future. Overall, I really enjoyed this resort. The overall quality of the resort, staff, restaurants and bars was high. We enjoyed our meals here, our drinks :), our room and the interaction with the staff. I wouldn't hesitate to come back to this resort and I would definitely recommend it to my friends. While the resort is known as more of a "lively" Sandals than other properties, it was certainly not over the top. If you wanted to meet people and join in the party, you were more than welcome. However, if you are here with your significant other for a little romance, there is plenty of opportunity for that also. I found it nice to have both options. You can do whatever you are in the mood for that day. Probably the one drawback to the resort is the fairly high charge for some optional activities as I noted above. Of course, even if you don't do any of these activities, you can still have a great time - as we did. We didn't pay anything extra for any activity during our stay and we really enjoyed ourselves and did not feel like we were missing out on anything. 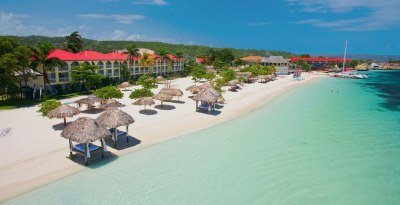 Comparing this resort to other Sandals resorts in Jamaica, we also stayed at a Sandals in Ocho Rios and found I preferred this resort, Sandals Montego Bay Jamaica, more. The primary reason for this was the beach. As I stated before, I am a beach person and I vastly prefer to hang on the beach and in the ocean than at a pool. If you are a beach person, I think you will love it here. If you are a pool person, I would probably recommend Sandals Grande Riviera. Whichever Sandals resort you stay at, I don't think you will be disappointed. If you need more general information on Jamaica, including location, weather, airport, etc. see our page on Jamaica general information. Disclaimer: I am an affiliate for Sandals (as well as other companies) and, as such, I receive a commission if you book through one of my links. I also received complimentary nights at the resort so I could experience the resort first hand. However, this has not influenced my review here and I hope you can tell that. If you have read through my site, you know I give you my no holds barred opinion including the good and the bad, regardless of my affiliate status. I have put alot of work into this site (and into this review) and my credibility online means everything to me. I want my readers to come back - and I hope you do. But, if you didn't find value from this review, or from my site, you can always go to the Sandals site directly. No hard feelings. Either way, have a great trip and let us know how it goes. So are you ready to get away after reading this Sandals resort review? If so, head over to Sandals where you can get 2 nights free plus save up to 60% and a $100 Red Lane Spa Credit at Sandals Montego Bay! And, yes, that is an affiliate link :) Have a great time!! Photo of main pool courtesy of Loren Sztajer, Thanks!